On your bike, Tour de France, London's where it's at. Prepare to get those giblets pedalling because Prudential RideLondon is getting ready for its fifth year. Developed by the then Mayor of London, Boris Johnson, in 2013, RideLondon was established in order to preserve and continue our Olympic legacy. The event is not only for professionals, but meant to inspire everyone to take up cycling and use it as a healthier and environmentally friendly way to commute around the capital. With roads closed off to motorists all around the city, it makes RideLondon a safe and enjoyable way for everyone to celebrate, whether it is by taking part or cheering from the sidelines. Grand Prix – Taking place on Friday, the Grand Prix is a circuit race for both injured veteran servicemen and women and the next generation of top cyclists at the Lee Valley VeloPark. FreeCycle – Saturday's eight-mile route around some of London's key landmarks, the Freecycle is for all ages and abilities, and particularly suited to families. You can travel the route at a leisurely pace as many times as you like, taking time to stop at different locations and enjoy a variety of entertainment. Classique – Taking place on Saturday afternoon, the Classique is the Women's Elite 5.5km race, which starts and ends at The Mall. Surrey 46 – The forty-six mile route begins on Sunday morning from Queen Elizabeth Olympic Park and is aimed a new and young cyclists. Surrey 100 – Aimed at slightly more experienced amateur cyclists, the Surrey 100 initially follows the same route, but it is extended to one hundred miles. Many of those participating take on the challenge to raise money for charity. Surrey Classic – Finally the one that everyone is waiting for, it's the Surrey Classic, which features the world's hundred and fifty top cyclists in a 200km race. If, like me, you are not a cyclist, there are still plenty of ways to join in and have fun. For RideLondon 2016, made my way to a spectator point to watch. Thinking that they would all be passing through at 9.30am, I got up bright and early to make sure I did not miss anything. I need not have worried, as the suggested time of arrival was actually a guide for when the first few cyclists would be passing through. I got into town so early that I was sat waiting on a wall for ages and was there to see very first cyclist pass by. Slowly, but surely, other individuals appeared, and then small groups. It was not until late morning that the main rush reached the area. Everyone cheered, clapped, and whistled, and lots of people bought clackers that were available from the festival stands. There are several entertainment areas along the route that spectators can enjoy, such as balloon animals, beauty sessions, and an appearance from Extreme Wheels Roadshows. 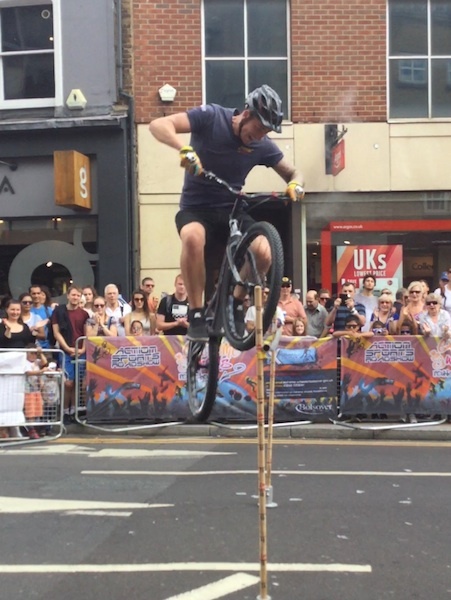 One of the three BMX performers was Joe Oakley, who was a semi-finalist in series five of Britain's Got Talent. The incredible show had them spinning and jumping at speeds and heights I would have never thought possible. At the end, everyone was allowed to line up to get a signed poster. If you are thinking about registering to any of the events, RideLondon provide advice on training, nutrition, gear, and where you can hire a bike if needed. There is also lots of useful information for spectators about the route, road closers, and available viewing points. To take part in the FreeCycle you can register. To take part in the Surrey 100, you have to enter a ballot. Ballots for the Surrey 46 open on the 1st March, while details on how to participate in other events will be provided later on.